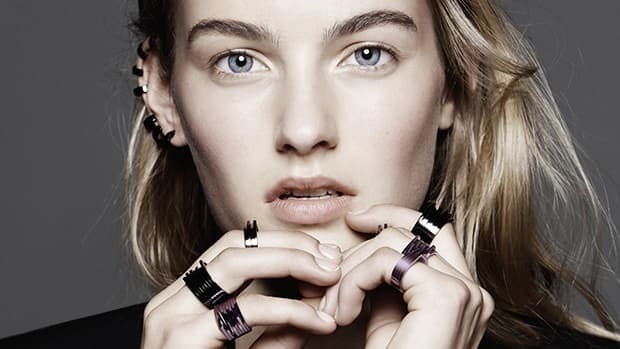 Italian jewelry brand Schield has released its fall 2014 campaign images, shot by Diego Diaz Marin. The series is called "Disorder Sisters," and, well, as the name might imply, they&apos;re definitely pretty dark in tone. "Is and disturbing story that tells a dark report between two sisters (sic)," the company said in press statement. "We wanted to create in this pictures the whole spirit of this mystical and dark collection (sic)." Many of the images are beautiful and engaging. The issue is that three of the images (included below) feature two women, one with her fingers down the other&apos;s throat. It&apos;s certainly one way to show off rings and bracelets, but it&apos;s also incredibly problematic to glamorize a very serious eating disorder like bulimia, to which these images seem to be alluding. "In our pictures we are not talking about bullimia, But our intention was to tell a story about two sisters playing in a dangerous way between them. But we never thought about the issue of Bullimia. We are totally against. Thank you, and sorry if it was a misunderstanding (sic)." While it&apos;s important to take Marin&apos;s statement at face value, it&apos;s also worth bringing up again that the photo series is called "Disorder Sisters." So at best, this was a terrible oversight; at worst, a calculated press move. What do you think about Schield&apos;s "Disorder Sisters"? The family-run business, led by Gaia Repossi, plans to use the minority stake to expand distribution. Gucci Is the Latest Luxury Brand to Have an Ad Campaign Banned in the U.K. The images featured "unhealthily thin" models.